This is a new thread for discussing developments at Reading Buses. Reading Buses is placing sixteen new CNG (Compressed Natural Gas)-powered Scania N280UD/ADL Enviro400 City into service on its busiest route, the 17. The vehicles are dual-door, the first to be supplied in this layout for Reading for many years. The lower deck has 23 fixed and 3 tip-up seats and can accommodate up to two wheelchairs, with the spaces otherwise available for buggies and standing passengers on this buty cross-town route. The first vehicle (710) enetred service on Friday 22nd December. There were timetable changes on routes 5, 6/6a, 26 and 33 from Tuesday 2nd January, plus minor adjustments to routes 3, 13, 15 and 42 mostly affecting journeys around school start and finish times. More substantial changes to Caversham routes 22, 23, 24, 25 and 27/29 have been deferred until February. I preferred it when it was swarming with Scania Metropolitans! Thank heavens for eclectic fleet managers. Reading Buses will also be operating Slough area route 2 (Slough - Windsor - Dedworth) commercially after First withdraws from the route later this month; this follows on from the contracts awarded to operate route 5, the evening service on route 4 and the Sunday service on route 6. 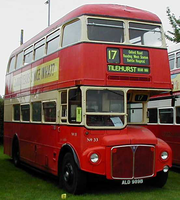 Reading Buses has been unsuccessful in its bid to operate Slough routes 10/11 (Heathrow via Datchet & Wraysbury) and 15 (Eton Wick), which were tendered by The Royal Borough of Windsor & Maidenhead. Vehicles for the new Slough services have yet to be confirmed. Vehicles for the new Slough services have yet to be confirmed. Just thought I'd start a thread for the various vehicles of Reading Buses which have been appearing on their newly acquired 702 service. I've seen a variety of DD and SD buses, some with 702 branding, some without, including E400 MMCs, a red Scania Irizar i3 (fleet no 26), a white Scania SD, and today a blue E400H City demonstrator with AD logos..
Any observations or comments welcome on the identity of these vehicles. Reading buses i think is due to have a dedicated fleet for the 702 soon but not sure what these buses will be. utterly dependent on how the next few months goes. Personally I cannot see the route surviving in it's current way. Meanwhile, back on home turf, the new timetables and routes for the Caversham services have been announced. The changes come into effect on Monday 19th February. The pink 22 becomes red 22 (presumably using Scanias 413/414 that were never repainted out of their scarlet 9 colours), and is extended via route 19, which it part-replaces, to Lower Earley ASDA. The basic service is hourly, with extra journeys at Monday-Friday peak times. The Sunday service is retained (it had been proposed for withdrawal) and will operate hourly between Caversham Heights and Central Reading, as now. Reading Buses has also negotiated with Thames Travel for its tickets to be accepted on route X39/X40 between Central Reading and Caversham Heights, this commences on 19th February. Routes 23 and 24 will be combined as circular routes, with the 23 operating anti-clockwise (out via Lower Caversham, in via Caversham Centre) and the 24 clockwise. Frequencies are similar to now. Route 25 will have a new timetable, but the route and frequencies will be the same as now. Routes 27 and 29 will be recast as circular services (or more accurately, a panhandle). From Lower Caversham route 27 will operate anti-clockwise via Caversham Central to Central Reading, returning via Reading Bridge to Lower Caversham; the 29 will operate in the opposite direction around the loop. This does mean that the two routes will depart from different stops in Friar Street. 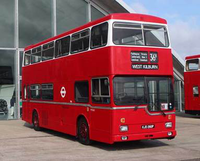 Each route runs hourly (combined 30 minutes) between 09.00 and 19.00. Before 09.00 Monday-Saturday buses operate between Lower Caversham and Reading Station Road via Reading Bridge in both directions (as now, but numbered 29 inbound and 27 outbound); after 19.00 Monday-Saturday buses operate between Lower Caversham and Friar Street via Caversham Centre in both directions (as now, but numbered 29 outbound and 27 inbound), and on Sunday buses will operate between Lower Caversham and Friar Street via Reading Bridge (as now but numbered 29 inbound and 27 outbound) - I imagine it will all take a bit of getting used to, even I got confused at times! The 19 is withdrawn, replaced as far as Lower Earley ASDA by the extended 22. There may well be changes to the 9 too as this currently interworks with the 19, although none have been publicised so far. Scoop - Reading Buses has managed to wangle being the first operator to try ADL's 10,000th Enviro400, which will be a demonstrator and has been kitted out to a high specification. It has been given temporary fleetnumber 759 779 (if you are looking for it on LVF) and is being trialled on Green Line 702 for just one week, starting today (Saturday 20th January). Also out and about on Green Line 702 at the moment is 778, this is a Scania N280UD/ADL Enviro400 MMC demonstrator and its temporary fleetnumber follows on from similar 775-777 which were loaned to Reading Buses last winter from ADL dealer stock. The trio has since been sold to Border Buses. Scoop - Reading Buses has managed to wangle being the first operator to try ADL's 10,000th Enviro400, which will be a demonstrator and has been kitted out to a high specification. It has been given temporary fleetnumber 759 (if you are looking for it on LVF) and is being trialled on Green Line 702 for just one week, starting today (Saturday 20th January). 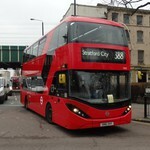 Do we know how long the Scania demonstrator will be about? I'd quite like a ride on that one. Unfortunately it doesn't seem to be in use today. BTW the ADL demonstrator is 779. 759 is a bog-standard MMC. Both are heading into London on the 702 at the moment. Oops, of course I know that - my mistake, sorry! I don't know how long Reading Buses will have the Scania, but i wouldn't be surprised if that was only around for a week as well.